You’ve probably encountered a library research guide before—perhaps you’ve taken a course that had its own LibGuide, or consulted your department’s guide for graduate study—but have you thought about using a research guide as teaching material? Library guides are not just lists of amazing resources, though they are that, too. They’re also glimpses into particular collections, models for research methods, and guides to disciplinary practices. You can use the guides to help your students think about how knowledge is structured, find material to supplement their coursework, and learn the modes of your discipline. As with any material, students will get the most out of a research guide if you give them a good reason to read it. Think through how your students are going to experience the guide and what, exactly, you want them to get out of it. Give them specific instructions on how to use the guide to form their research game plan. You might even make articulating a search rationale part of the assignment. It’s also important to connect the guide to the course material—there is nothing worse than experiencing research as mere busywork. Make sure your students understand how the guide is going to help them get more out of an important course assignment. Help students ferret out very specific primary material. Want them to locate a magazine editorial statement from a particular period or region? Fred Burchsted’s guide to finding material in periodicals will give them the resources they need. Learn how the public felt about this week’s lecture topic? Steer them toward Diane Sredl’s Guide to Public Opinion Data Resources. Find material on the Arab Spring? Law School Librarian Terri Saint-Amour offers search tips and links to special digital archives. As always, make sure you’re sending students to the guide with an interesting question and a clear set of tasks. Identify important skills. You might pick one of the “Tools of the Trade” from Sue Gilroy’s indispensible guide for new researchers and make an assignment out of it. For example, you might take the section called “General strategies for using Hollis well” and turn it into a worksheet. Each member of a team uses one of the strategies to find a “companion” book for one of the major works on the course syllabus; the resulting pairings serve as a starting point for discussing how that work has been understood over time. Model research methods. For example, if you want students to do intensive work with a special collection, a good warm-up assignment might be to ask them to read Steve Kuehler’s “case study” about finding material on theater fires in the Theater Collection. It takes some thinking to find fire-related material in a collection organized by title, theater name, and premiere date: the case study walks students through that process. Ask students to think about topics that might surface similarly hidden material in a special collection, or encourage them to use the same strategies to enrich their findings on a more traditional topic. Teach your discipline. Research guides will identify the most useful research databases, encyclopedias, and dictionaries; they might list major journals, web portals, and professional associations. And they help teach students the angles from which researchers in your discipline approach their material: consider the tab names on Pam Matz’s “Research Guide for Folkore and Folkloristics”: Narratives, Fairy Tales, Mythology, Oral Literature, Dance, Craft & Art, Ethnography, Ethnomusicology. In English, Laura Farwell Blake and Sue Gilroy organize their “getting started” guide into sections on close reading, contextualized reading, and scholarly conversations. Kathleen Sheehan and Diane Sredl divide their guide for Government thesis writers into “American Government & Politics,” “Political Theory,” and “International Relations and Comparative Politics.” In performance studies, Steve Kuehler’s one-page guide defines a production history and gives a rationale for why you might want to write one. Prepare for a library session. If your course includes a substantive research assignment, you’ll probably schedule a class meeting with a research librarian. It’s a great idea to give students an assignment that requires them to work with the relevant research guide before the library session: this will not only give them some familiarity with the look and feel of the various research tools, it will also give them a chance to encounter the inevitable snags. The library session can then focus on real rather than hypothetical questions, with more time devoted to advanced research strategies. Here’s a suggestion for giving your students practice coming up with feasible research topics to try out: pick a journal article from the assigned reading and have an in-class conversation about what the article’s “topic” might be, then ask students to come up with their own variation on that topic and use your department’s research guide to put together a practice bibliography. The HCL LibGuides homepage has a nice interface with dynamic subject headings, but remember: it’s only for FAS guides that are written on the LibGuides platform. 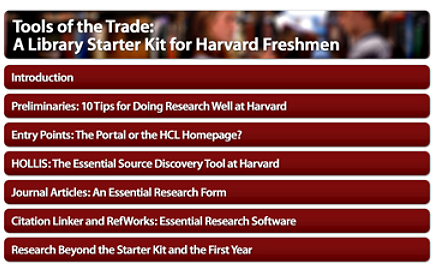 The Harvard Library Portal offers a more complete list, organized by general subject area. A little trickier to navigate, but more inclusive. 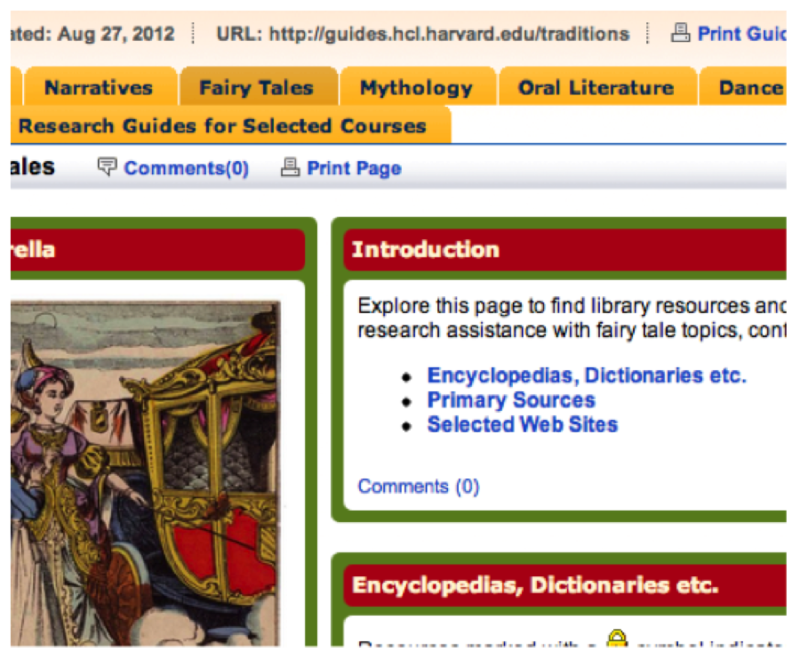 Individual library websites: there are over 70 libraries in the Harvard system, and most of them have robust home pages that include guides, overviews, digital material, and other bonus features. See, for example, the Woodberry Poetry Room, the Harvard-Yenching Library, and the Botany Library—and that’s just the beginning! …or you can request your own! Contact your research librarian, who will work with you to create create a customized research guide that fits your course’s needs. Think about what kinds of materials you want listed, what approaches you want your students to take, and whether you’d like to write any introductory text for the guide. This takes some lead time, so make sure to plan ahead! In addition to research guides, the library offers a plethora of multimedia material and other neat features. The Open Collections Program offers subject-specific, web-accessible collections that can support teaching and learning around the world. There are online exhibits that you can use as a focused entry point into a topic. See, for example, Houghton’s Thackeray exhibit. 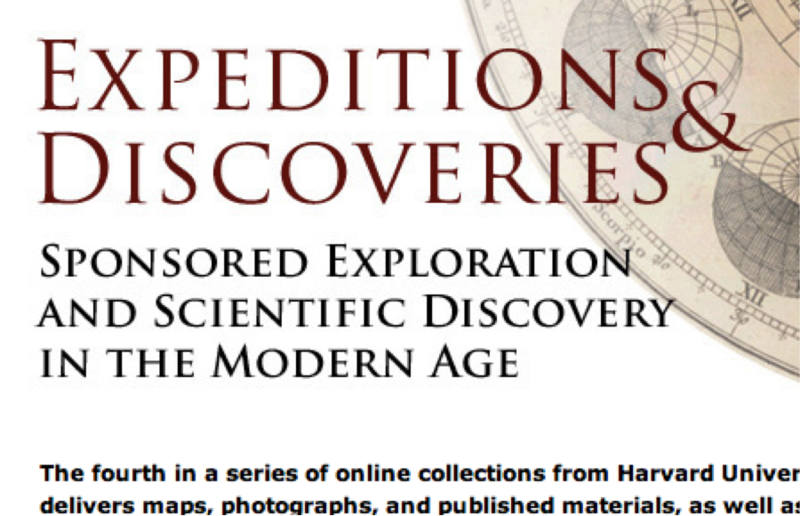 Or you might encourage students to explore another one of Harvard’s digital collections and find a new item to connect to the class reading each week. Have you used a research guide in a classroom assignment? Let us know! This post was written by Odile Harter.